Modehaus “Florence” silk pantsuit ($2,275) from Modehaus Bridal Atelier. Argento Vivo silver earrings ($58), Lagos diamond ring ($895) and Jeffrey Campbell “Varada” leather mules ($110) from Nordstrom. Sheer socks ($12) from Free People. Copper crown ($24) from Terrain, with floral adornment by Andrea Holton. Claire Le Faye “Love Her Madly” cotton lace gown ($2,600) from Flutter Bridal Boutique. Diamond ring ($57,950) and earrings ($2,100) from JB Hudson Jewelers. Floral headpiece by Andrea Holton. Pronovias “Dria” floral lace gown ($2,340) and Mariell drop earrings ($80) from Brides of France. Lia Terni leaf headpiece ($330) from a&bé bridal shop, with floral adornment by Andrea Holton. Diamond ring ($132,000) from JB Hudson Jewelers. Berta style No. 17-113 plunge silk crêpe gown with cape (price on request) and Maria Elena “Rustic Havana” headpiece ($750) from L’Atelier Couture. Diamond ring ($132,000) from JB Hudson Jewelers. Anna Campbell “Tash” embellished Grecian one-shoulder gown ($3,455) from a&bé bridal shop. Jessica McClintock crystal tiara ($169) from Brides of France, with floral adornment by Andrea Holton. Diamond ring ($132,000) from JB Hudson Jewelers. Joynoelle layered multifabric gown (price on request) from Joynoelle Boutique & Atelier. Untamed Petals “December” gold headpiece ($388) from a&bé bridal shop. Diamond ring ($10,100) from JB Hudson Jewelers. 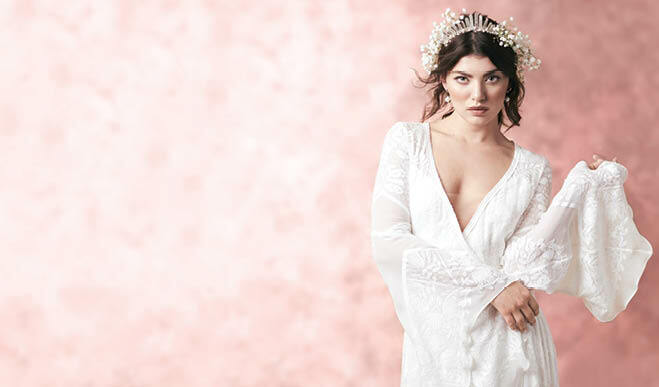 Rue De Seine “Wild Harlow” bell-sleeve wrap dress ($3,150) and Emma Katzka “Chloe” crystal headpiece ($348) from a&bé bridal shop, with floral adornment by Andrea Holton. Pearl earrings ($3,000) from JB Hudson Jewelers.